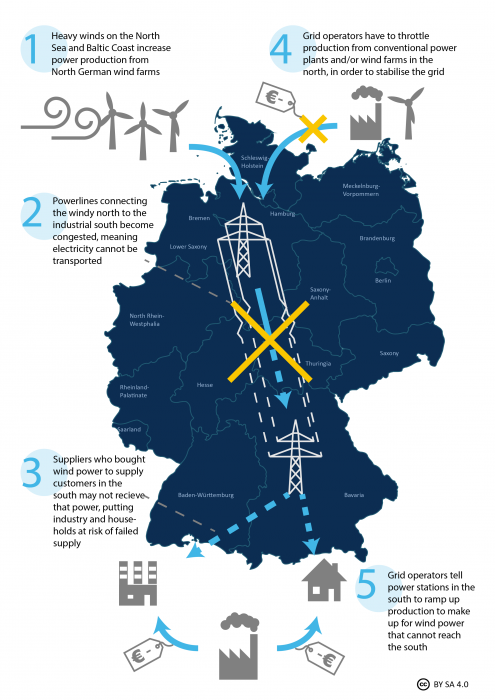 The German electricity grid: notoriously swamped? A major challenge for the German energy transition will be the adaptation of its grid infrastructure to an increasing share of renewables, especially wind and solar. Justus Irmen looks at how the country can become more flexible and avoid transmission bottlenecks. The transformation from centralized to decentralized electricity generation from intermittent renewable energy sources poses entirely new demands to the management of the electric load on the transmission grid. The German term “Kupferplatte” (“copper plate”) is sometimes used to refer to the desirable, but far from accurate, image of a fully connected and conductive electricity grid in Germany. As a matter of fact, the transmission lines are not able to perfectly cope with the load in some areas of the German electricity grid. Basically, there are two approaches to the problem of transmission lines congestion: sound planning of future grid expansion to adapt to new supply circumstances or reforming the wholesale market design to steer the demand through regional price differences. The latter approach might be cost-efficient alternative to the prevailing grid expansion strategy. Currently, the German wholesale market design does not take into account the existence of such physical bottlenecks. A number of highly energy intensive industries are located in the South of Germany. And as nuclear plants are phased out in the Southern states, more and more electricity needs to be transferred from the North to the South of Germany. Now imagine the following situation: A retailer in the South of Germany buys electricity from a large wind power plant in the North. It is a cloudy day in the South and heavy winds are blowing at the Northern coast lines. The shutdown of solar PV in the South and the continuous supply from Northern wind farms create an imbalance in the power system congesting the transmission lines to the South. In response, the system operator dispatches some of the generation from the wind power plant to a power plant in the South or imports additional electricity from Italy, Austria or Switzerland. Still, the Northern wind power plant operator is remunerated by the TSO for not being allowed to deliver all of the electricity, as agreed upon with the retailer. The costs for this re-dispatch or other so-called ancillary services, that is adjustments performed close to real-time to balance the physical load in overall electricity supply, are integrated into the general electricity tariff. Consequently, the costs for inefficient load distribution due to structural shortcomings are borne by the consumers. And indeed, in Germany, the costs for ancillary services and re-dispatch measures in particular have risen significantly in the past years. Costs for re-dispatch measures alone rose from 186,7 million Euro in 2014 to almost 402,5 million Euro in 2015, then witnessing a drop in 2016 which could however be attributed to weak wind circulation in this year. But it is not just that. The poor transmission grid infrastructure even affects Germany’s neighbors. If the conditions in Northern Germany are favorable, chances for congestion are high and therefore electricity is redirected through the grids of neighboring countries, simultaneously reducing their ability to export their own electricity. This has already led to some serious contention between Germany and its neighbors, particularly in the East. Managing the congestion along the North-to-South transmission bottleneck could either be achieved by further expanding the grid infrastructure, or by applying a completely new market design. The German think tank Agora Energiewende, for instance, has suggested a splitting of the German wholesale market based on regional supply and demand characteristics. Similarly, the European Commission has suggested the division into two price zones, at least if new transmission lines from North to South are not built. The creation of price zones would lower the price where much electricity is available and the grid is not working to its capacity, and alter the price, where electricity is short and the power lines are busy. Ultimately, this would incentivize a more even load distribution across the electricity grid, because large consumers settle where electricity is cheapest. It would also lower the costs related to congestion management. In Germany, electricity from Northern lignite plants might become more costly and, consequently, electricity from renewable energy sources more competitive. Finally, it would put an end to the congestion of neighboring power grids by allowing for more efficient cross-border regional electricity trading. Much opposition to the price zone model though stems from the industry in the South that would most likely face higher electricity prices. The energy transition inevitably leads to a higher share of electricity from renewables energies in the grid and thus a fundamental change in how electricity distributed. In view of this changing environment and a commitment to regional cooperation with its neighboring countries, Germany has to think about how to manage the challenges that go along with that transformation when re-designing the regulatory framework of its future electricity market, in particular if the energy transition shall be conceived as a concerted European project. The price zone model offers a market-based approach to transmission grid planning. After a transitional period, electricity consumers might evenly distribute across the grid following regional price signals. The conventional grid expansion planning that is meanwhile applied in Germany, is notoriously trying to catch up with the increasing pressures on the transmission infrastructure. Justus Irmen is a young professional interested in climate and energy policy, power sector regulation and academic research. He holds a Bachelor’s degree in European Public Administration and a Master’s degree in Public Administration from the University of Twente. Let me saddle up my hobby-horse and say again that if electric utilities want to build new high-voltage power lines, they should pay attention to the design of the pylons. It’s hard to make these beautiful, but the Danish, French. Finnish and British grids have all deployed monopole designs that are much less objectionable than the fussy lattices of the 1930s. Study after study has shown that wind and solar-based power is more practical and economical when the generation is integrated over a large geographical area, since this partly evens out the intermittency. The solution offered here, that N/S transmission remain modest while a substantial fraction of the industrial base in Bavaria and Baden-W migrates to the North, would help, but is almost certainly not optimal. Shut down the lignite plants in the North producing excess electricity and start the gas plant in the south: problem solved. The issue here is that power plants are called according to the cheapest production cost and not to cheapest cost of delivering electricity. Making power plants connected to the transmission grid pays for their full transmission cost would fix that. Next PostHow many new power lines will Germany need?